The following article was taken from a publication called “The Gentleman’s Magazine” of December 1785, published by a Mr. Sylvanus Urban. 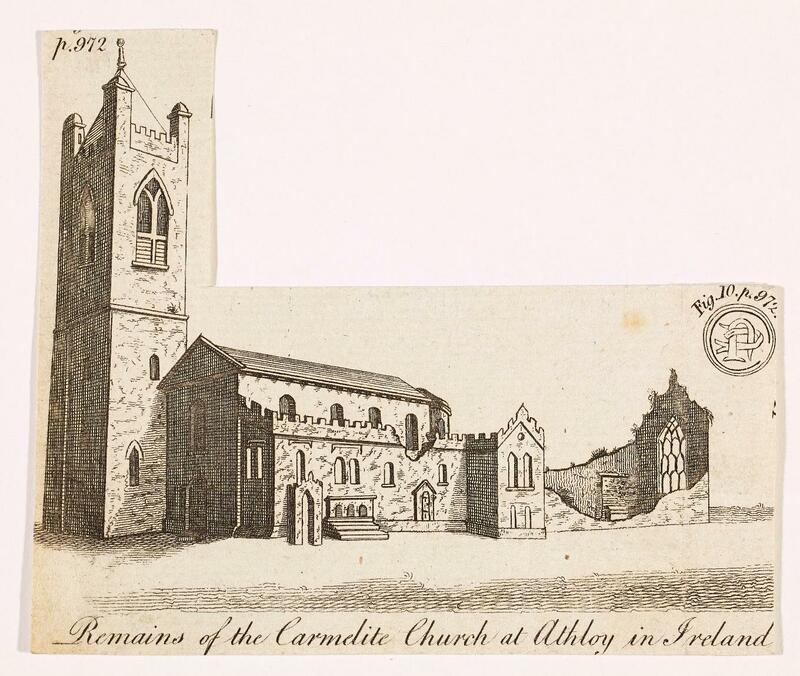 This article describes the ruins of The Carmelite Monastery at Athboy and includes a sketch which dates from about 1765. The author simply signed the article as A.M.T. These ruins have undergone many changes over the past two hundred and fifty years, but the church tower remains largely the same. This site is now the location of The Church of Ireland. The Gentleman’s Magazine, being no longer copyright, is in the public domain and is available to view on Google Books. Your former notice of the artless draft I sent you of the Yellow Steeple at Trim, encourages me to trouble you with a coarse view of another ancient building in the neighbourhood of the same steeple. It is a rough prospect of part of the remains of the Monastery Church of the Carmelites at Athboy, in the county of Meath, in Ireland, and within which the inhabitants have constructed their present parochial church. I am not a draughtsman, nor pretend to be such; and can recommend the inclosed scratch (sic) to you no otherwise than by assuring you that it is a just representation, although taken some years since. The tracery window at the east end has been since destroyed, and the branched and upright work all taken away; not to adorn any other edifice, but to lie scattered in the churchyard, where the inattention of the inhabitants suffers what is now left of it to remain exposed to every injury that can arise from accident or depredation. It certainly deserves a better fate, having been uncommonly light and elegant; but in its present wretched state it was impracticable to trace the course of the upright pillars, or the ramifications of the upper branches. Close by this window are two very ancient tombs, one on either side, (the northern one shewn in this sketch), with very long Latin inscriptions, now hardly to be made out, and within the south aile,(sic) whose walls are here represented, are other antique monuments, some without inscriptions, and some with mutilated figures. In the vault of one of these tombs the covering flag fell in, and discovered a corpse which had protruded hair through all the interstices of the coffin. I saw it in such state some twenty years ago, since which time I have not been in that country; or I should endeavour to copy some of the monumental inscriptions I have mentioned, so far as in my power to make out; and infirmity will not allow my undertaking such a journey. Should this appear sufficiently material to engage a column of your valuable compilation, I shall not make any apology for transmitting it. Next PostNext Headstones & Monuments at St. James Church of Ireland (Old Cemetery).